How do I remove weakauras white text, so its just omniCC numbers that shows up? Go into the weakaura and instead of %p type a space "spacebar" and hit enter or leave the weakaura. hi i love the weak aura. It's covered in the first post, make sure you downloaded the textures, put them in the correct folder, and then restarted your client otherwise you'll get those green blocks that indicate the textures are missing. This wa is awesome, thanks so much! I'm just really having a hard time getting the auras and cds to only show up in cat form. Admittedly I'm a big noob still when it comes to wa2. Could you possibly do a little tutorial on how to set that up? I've been using this WA, with a few tweaks to fit my own UI, for a long time now. I just wonder, when was it last updated? Maby some good changes I've been missing out. And how do I know what version I am using right now. Could you help me find out please? Galavianor wrote: This wa is awesome, thanks so much! I'm just really having a hard time getting the auras and cds to only show up in cat form. Admittedly I'm a big noob still when it comes to wa2. Could you possibly do a little tutorial on how to set that up? Well uh, the unfortunate answer is if you're a "big noob" its probably too difficult to set this up It requires adding triggers to many of the display elements as well as splitting some of the displays into multiple parts to be able to add those triggers. Hmm, don't know when it was last updated. There's probably a post documenting it somewhere in the past couple pages but too lazy to go find it. 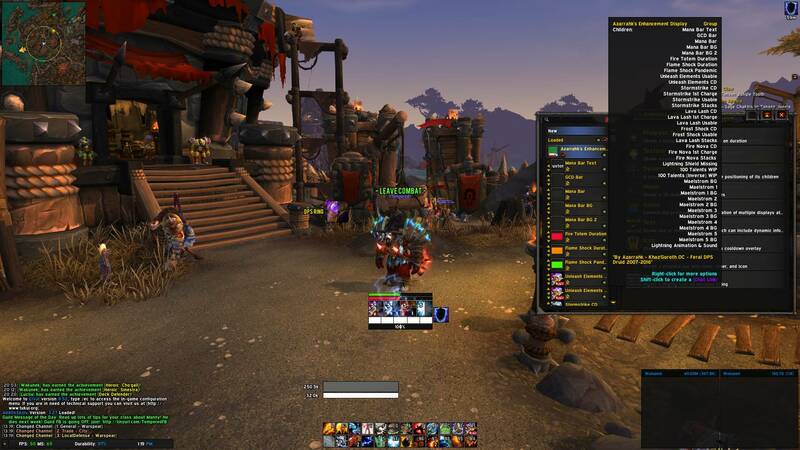 You can find the version of your display by mousing over the display group in the left panel of your WeakAuras options, it should say in the group description. Edit: According to the pastebin it was last edited July 5th, so there you go. Hey! Thanks for the quick reply. I looked it up and apperently I got version "v1.14 - by aggixx"
Bleeds that fade from an enemy that you are not targeting now show the proper overlay state when you retarget them. Energy bar now dynamically refreshes your max energy when you Berserk. I have to do this in preparation for the T18 2p since I don't particularly want to mess with gear tracking. Fixed a bug with Rake state snapshotting when applied to an enemy that is damage immune. Some miscellaneous cleanup including moving a couple auras together that didn't really need to be separate. You can find the new version in the first post by clicking here. Fixed an issue where snapshots did not function correctly when applying Rake or refreshing Rip with Bite during Spirit Shift. Fix the whole display being broken. Add an option to show the length of the partial ticks on your Rip and Rake debuffs. You can enable this behavior by going to "Snapshot Controller" > Actions tab, and in the On Init Custom Code change the value to true. Fixed Improved Rake snapshotting while Spirit Shift is active. They fixed the reason you'd want to use the partial tick tracking option, but otherwise I'd say the changes are fairly pertinent. Thanks for taking your time to gather this information for me, It really helped me decide. I will update as soon as possible! Thanks again Aggixx! Much drood love to you! Hello! Just wanted to say thanks Aggixx, awesome auras! I have a question, how can I make the Energy Bar/Combo points only show on cat form? Created an account simply to say thank you! Saved me a bunch of time. In the video, you have a scrolling combat text on the right side of the screen. Would you mind telling me which AddOn that is? Thank you. Is there a way to get the CP bars to work for Enhancement Shaman's Maelstrom stacks? I've tried it but the bars have visual durations instead, if that makes sense. Thanks in advance! is it possible for the energy bar to switch to rage bar on entering bear form and mana bar whilst in no form? Azarrahk wrote: Is there a way to get the CP bars to work for Enhancement Shaman's Maelstrom stacks? I've tried it but the bars have visual durations instead, if that makes sense. Thanks in advance! I'm not a very experienced kitty but I've been using these strings for about six months in my grind toward HFC from ground 0. I've read at least once every single post in this thread, but find it very hard to search because the search engine thinks I'm an unsophisticated dolt. Somewhere aggix, I thought you had created your own bear strings and linked to them in a post. Was I dreaming? If so, can you direct me or repost? Just re-subbed and installed this as the first addon (so i have no others). I get 2 timers on every icon, one with decimals and one without. I can remove the one with decimal by editing "%p" and the one without by un-checkking the Cooldowns box, however this also removes the cooldown animation. I would like to keep the cooldown animation, and the decimal timer - is there any way to do this? I've been goofing around on the beta, leveling as a feral. And luckily, the WeakAuras have worked just great so far for Tiger's Fury and Bloodtalons in Legion Beta. However, (1) the removal of "Improved Rake" as a standalone spell (now folded into Rake's core functionality) and (2) the removal of Incarnation applying the Rake stun have broken the logic you built in behind the double-damage Rake purple indicator in the WeakAura Set. Edited ... code box was breaking formatting of the forum/swapped to pastebin. Does the Pandemic tracking take into account Jagged Wounds? I've been using DroodFocus since forever, but I like what i saw in the video you made, so I'm going to check it out, just gotta see what I can do about making it track my bear abilities in the same spot when i'm facerolling through those call to arms bags, lol! I'm using your Wa since a long time .